An impressive 22 swimmers from St. Peter's National School in Snugboro competed in Leisureland, Galway at the Connacht Minor Schools Championships recently. There were some fine swims on the day, and six swimmers go forward to the All Ireland finals which will also be held in Galway in early December. First to qualify for the All Irelands was Rachel Henehan, in the 50 meter back stroke; Niamh Breslin, Una Togher and Siofra McHale qualified in the 100 meter IM; Sean O'Connor got through in the 50 meter freestyle; while Clodagh Healy qualified in the 50 meter butterfly. 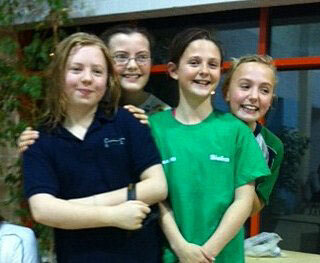 Snugboro girls medley relay team who qualified for the All Ireland Minor Schools championships. Una Togher will also go forward for the All Ireland final in the 50 meter breaststroke, and Siofra McHale will swim in the 50 meter backstroke. Sheena Morris swam very well but narrowly missed out - by just nine splits of a second - on a qualifying time in the 50 meter freestyle. The girls' 12 and under relay team took the bronze medal in the 200 meter medley relay, while the boys placed sixth in their race. The girls freestyle relay team placed fifth in the 10 and under category, and the under 12s placed sixth in their age group. Also swimming well for Snugboro on the day were Mairead Gallagher, Brianne Horan, Sarah Conlon, James English, Meghan Deely, Evanna Lyons, Ava Walsh, Sheena Morris, Sarah Shally, Tommy Huang, Leo Shally, Sarah Bourke, Dearbhla Keane, Carla Lyons, Tiernan Walsh and Anna Guthrie. The swimmers enjoyed a robust team spirit and camaraderie, and they were well looked after on the day by parents Katrina Conlon and Maria Healy. The Spring Onion Puppet Theatre visit Snugboro N.S. Third Green Flag for Snugboro N.S.